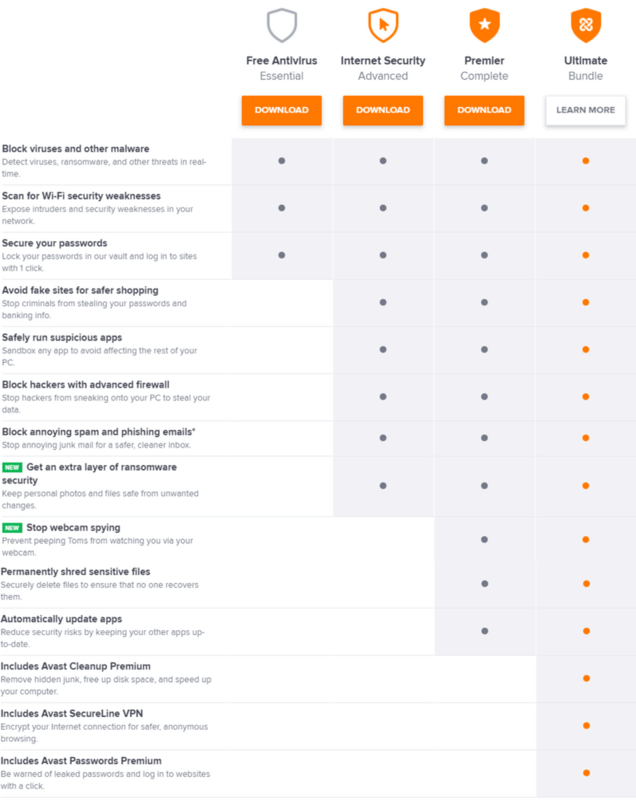 Bitdefender or Avast, which antivirus software is a better choice in 2019? Read this in-depth, data-driven comparison to make a wise decision. In this comprehensive Bitdefender versus Avast comparison, you’ll see what’s included in different security products both antivirus companies offer, as well as how both software stack up against one another in terms of malware protection, impact on system performance, user interface, cost and more. Do you know almost half of all computer users worldwide have been (or will be) infected by malware? In the modern, digital age, there are more devices connected to the internet (and to each other) than ever. Do you know the AV-Test firm, which is an independent security lab, picks up more than 350,000 new malware samples every day? The frequency at which malware attacks are happening these days is both scary and alarming. Hackers are continuously coming up with new ways to break into your devices (mainly computers and smartphones) to compromise your data and breach your privacy. So how do you protect what matters to you against rampant malware attacks? You need a reliable antivirus suite to stay protected against evolving digital threats, like destructive ransomware, data-stealing Trojans, worms, viruses, and more. Luckily, most top-rated antivirus programs automatically update their malware definitions several times a day, providing immediate protection against all the latest cyber threats in real-time. While free antivirus programs (like Windows Defender) can be useful, they don’t include advanced security-related features and extra tools that enhance your security. Plus, most free security solutions don’t offer real-time malware protection. For these reasons, we strongly urge you to invest in a premium antivirus solution for complete security. First, let’s look at the security suites both Bitdefender and Avast offer. If you don’t have time to read the whole comparison, here is a graphic that summarizes the whole comparison. Avast offers more security-related features and extra utility tools in its security products than Bitdefender. Independent tests prove that both software provide excellent protection against all sorts of malware, but Bitdefender is better than Avast in terms of impact on system performance. Bitdefender Antivirus Free Edition provides “essential protection without the extra stuff.” It packs great protection (there’s no doubt about it) but includes only the essential security-related features — as you’d expect in freeware — and very few extra utilities that have become commonplace tools in other free antivirus products. It lacks a common utility like a password manager but includes protection against phishing and fraudulent sites. Bitdefender’s Home Scanner, which is available a free separate download, checks for vulnerable devices and passwords in your network and offers detailed security recommendations to help you improve your security. Bitdefender also offers free adware and ransomware removal tools as separate downloads. Next level up is Bitdefender Antivirus Plus 2019. It adds a game/silent mode option, a secure browser for safer online shopping/banking, a password vault, a file shredder (helps you delete sensitive files safely and permanently), and a battery saver. As a paying customer, you’ll also get premium customer support. It also adds a vulnerability scanner (checks for security holes, outdated/vulnerable software, missing Windows patches, and potentially dangerous settings) and a rescue disk option to remove deep malicious infections. Advanced ransomware protection and social network monitoring are also part of Bitdefender’s Antivirus Plus 2018 suite. 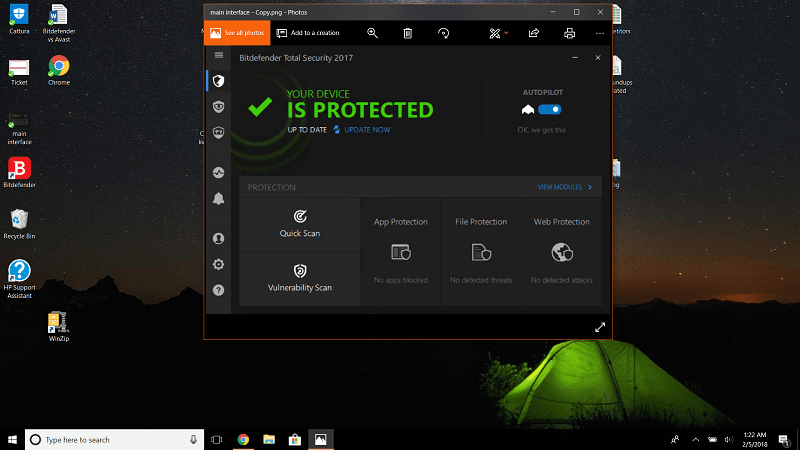 The next step up is Bitdefender Internet Security 2019, which adds webcam protection, parental control features, a Safe File feature to cordon off your important files from ransomware attacks, a two-way firewall, and an anti-spam to block spam emails. With Bitdefender Total Security 2019, you’ll get everything in the “Internet Security” plan plus several performance optimization features, like OneClick Optimizer, Disk Cleanup, Startup Optimizer, and an anti-theft feature (helps you find lost or stolen devices). Bitdefender Family Pack 2019 protects unlimited family devices with a “Total Security” license. Note: All the above security suites only work with Windows except the ‘Total Security’ suite, which is for Macs, too. Now, let’s talk about what Bitdefender offers for MacOS. For Macs, Bitdefender offers a free Virus Scanner, which — much like its freeware for Windows — contains only the essential security-related features. It also offers two free Mac utility tools — Adware-removal tool and TrafficLight (a web filter that blocks malicious content before it reaches you). To get premium protection and features, you must upgrade to Bitdefender Antivirus for Mac. Besides providing excellent protection against all kinds of malware threats, it blocks annoying adware, safeguards your backups, and also keeps ransomware at bay. Note: Both Bitdefender Total Security 2019 and Bitdefender Family Pack 2019 are compatible with Mac platform, too. Avast offers separate antivirus solutions for Windows and MacOS. First, let’s talk about the products for the Windows operating system. Unlike Bitdefender’s freeware, Avast Free Antivirus is one of the most feature-rich antivirus software out there. Besides great malware protection, it includes web & email protection, a password vault, a home network inspector (checks for vulnerable networks and settings), a software updater (tells you which of your software are outdated), and a silent/game mode feature. You can also create a rescue media to eradicate malware that has severely infected your system. Avast SafeZone browser (which is now discontinued for improvements) protects your online shopping/banking experience, while its Online Security browser plugin blocks phishing and dangerous sites while you surf the web. The next level up is Avast Pro Antivirus, which adds Sandbox technology (enables you to test potentially dangerous files in a virtual environment), real site feature to prevent hackers from taking over your DNS settings, and premium support. Avast’s Internet Security adds an advanced firewall, an anti-spam to block junk emails, and top-drawer ransomware protection. With Avast Premier, you’ll get everything in the “Internet Security” plan plus a file shredder and protection against webcam spying. Also, it will automatically update the other out-of-date applications for you. Avast Ultimate suite adds a Cleanup Premium (improves system performance by cleaning junk), a SecureLine VPN to help you browse the web anonymously, and a premium password vault. Now let’s talk about what Avast offers for MacOS. Avast offers two security solutions for Mac – Avast Security and Avast Security Pro. 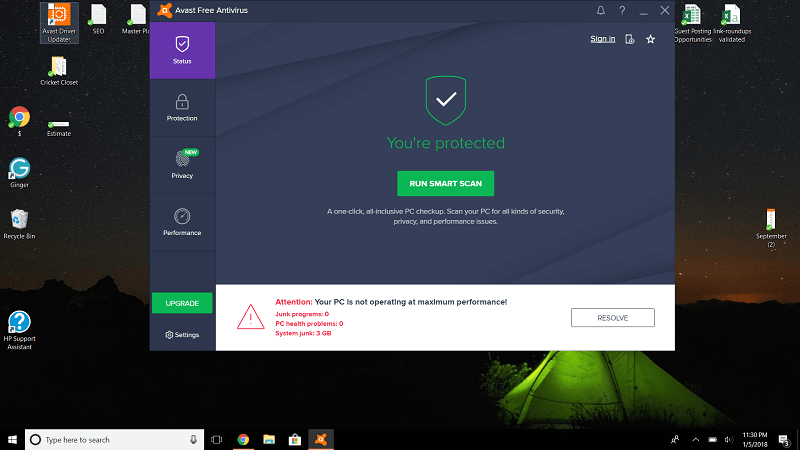 Avast Security incorporates top-drawer anti-malware security, web & email protection, and a WiFi security scanner, while Avast Security Pro adds protection against ransomware and WiFi intruders. Bitdefender and Avast, like most other modern antivirus solutions, use signature-match detection (i.e. checking a suspected file against a huge, robust library of malware definition files) and Heuristic monitoring (checks for behavior characteristics of files) to catch all sorts of known and unknown malware threats. If anything is suspected to be dangerous, it is uploaded to cloud servers and if confirmed to be malware upon testing, it is then added to the malware database and sent out to the users in form of new signature updates, which goes out several times a day. Usually, all the security suites of antivirus products share the same malware-detection engine. To see which product offers a better level of protection against malware, I’ll look at how both products performed in the recent tests conducted by AV-Test and AV-Comparatives – two independent security labs that regularly test major antivirus products. In the AV-Test’s most recent tests, which took place in November and December last year on Windows 10 platform, both software were tested against 185 samples of zero-day malware and 10,684 samples of widespread malware. Bitdefender successfully detected 100% of both types of malware in both months, earning a ‘perfect’ 6/6 star rating. Avast came up with more or less the same results; it detected 100% of the zero-day malware in both months, and 99.9% and 100% of the widespread malware in November and December respectively. 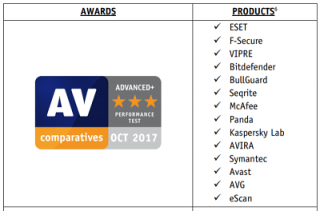 In the AV-Comparatives’ most recent real-world protection test, which tested the top antivirus products against real-world malware threats, Bitdefender and Avast both received a perfect “ADVANCED +” rating courtesy their near-perfect 99.9% and 99.6% protection rates and low wrongly blocked scores of 3 and 11 respectively. 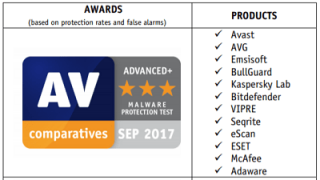 In the AV-Comparatives’ most recent malware protection test, which judged the antivirus product’s ability to protect the system against malware (before, after, or during execution), both Bitdefender and Avast once again received an excellent “ADVANCED +” award courtesy their 99.95% and 99.99% protection rates respectively. Avast returned 9 false alarms (i.e. falsely identifying clean software as malware) in the test while Bitdefender came up with 5 false positives. So it’s clear that both Bitdefender and Avast provide top-notch protection against all sorts of malware. Bitdefender vs Avast: Which Software Puts Less Impact on System Performance? All modern antivirus products continuously run in the background to provide real-time protection, which means they occupy some percentage of system resources all the time. A security software that provides a great level malware protection along with many extra security-related features but degrades system performance is not necessarily a good product. Again, I’ll look at the independent tests to see which of the two product requires low system resources to operate. In the AV-Test’s performance study, which took place in Nov-Dec 2017, their experts looked at the influence each security solution had on computer speed whilst executing common operations, such as launching websites, downloading and installing applications, copying files. Bitdefender received an ‘excellent’ 6/6 star rating from the experts in this test. Here’re the results of the same study when conducted on the same PCs with Avast installed. Avast’s scores weren’t as perfect as Bitdefender’s but it still received an ‘impressive’ 5.5/6 star rating. AV-Comparatives’ performance test, which was held in September last year, involved 21 antivirus products. They ran several typical computer operations — such as file copying, archiving/unarchiving, installing/uninstalling apps, downloading files, browsing websites – to see how much impact each product puts on system performance. Both products received an excellent “ADVANCED +” award, but Bitdefender fared slightly better than Avast in this experiment, too. Its impact score (the lower the better) was 4.2 as opposed to the Avast’s 8.9. While you can rest assured that none of the software will significantly degrade your system performance, it has to be said that Bitdefender received slightly better results than Avast in both of the independent tests. Bitdefender vs Avast: Which Software Boast a Better User Interface? Bitdefender offers two interfaces, one for the free antivirus and the other for its paid suites. Since its freeware doesn’t boast a lot of advanced security features and bonus utilities like Avast Free Antivirus, its interface is minimalistic and follows a set-it-and-forget-it approach. There’re few options and settings other than a “Scan Computer” button on the main window which lets you run a full computer scan. Bitdefender’s premium suites come with a more robust interface. It contains a vertical menu on the left which contains the following items: Protection, Privacy, Tools, Activity, Notifications, Account, Settings, and Support. You’ll see the name of the plan you’re subscribed to at the top and, at the bottom, there’s a link which takes you the Bitdefender Central online portal from where you can manage all of your devices at one place. Now let’s dig into the Avast’s interface. 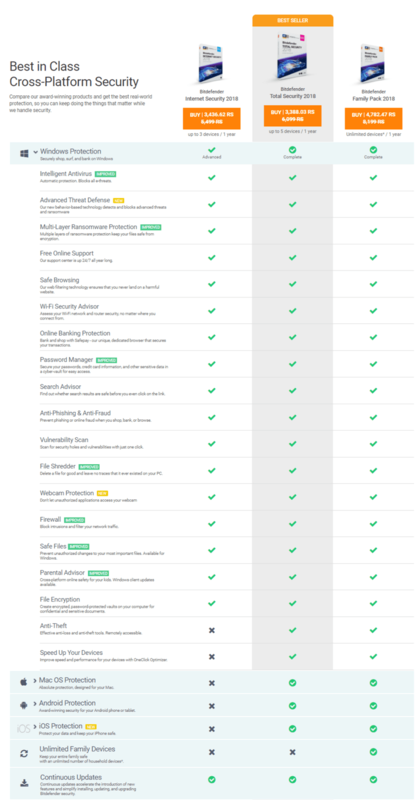 Unlike Bitdefender, Avast offers the same interface for all of its security products. At first glance, it may come across as a little less complicated than the Bitdefender’s interface. It has four items arranged in a vertical menu: Status, Protection, Privacy, and Performance. The default window displays protection status and a button to run what Avast calls a ‘Smart Scan.’ The ‘Protection’, ‘Privacy’, and ‘Performance’ tabs elegantly open all the features and options associated with each item. The name of the suite you’re subscribed to is displayed in the title bar. At the bottom-left, there’s a button which leads you to the ‘Settings’ page, and just above it is a button to get you to upgrade to a higher plan. Overall, Bitdefender’s interface (the one for the premium products) seems a little more complex and overwhelming than Avast’s. Bitdefender vs Avast: Which Software Costs More? First, let’s look at Bitdefender’s suites. Now, let’s take a look at Avast’s security suites. Bitdefender vs Avast: Which Software Is More Popular? No one can deny that Bitdefender and Avast are two of the most popular antivirus solutions among users. Bitdefender claims to be “protecting 500 million users worldwide” while Avast says it is leading the market with 400 million users (that includes AVG users, too). Let’s look at the independent statistics to get a clear picture. OPSWAT publishes monthly independent reports on the market share of different leading antivirus products. According to their recent report, Avast’s leads the market share by a whopping 19%, followed by ESET and Malwarebytes with 14.03% and 12.73% respectively. Bitdefender is seventh on the list with 6% share, which is not too shabby but well below the Avast’s market share. Also, on download.com, which is the world most popular software download portal by CNET, Avast beats Bitdefender by a huge margin in terms of overall downloads. On social media, Avast once again shows its dominance; it has 4.1 million Facebook fans and 182K Twitter followers, as opposed to Bitdefender’s 1.3 million and 82K respectively. So it’s evident that Avast is more popular among users than Bitdefender. All things considered, both Bitdefender and Avast offer several premium security suites to match your protection needs. if I install Bitdefender, then should I remove the current avast program? Thanks for your comment. There is no need to uninstall Avast if you have paid for it. Just stick with it till your subscription lasts. The Avast family license packs seem to be quite unclear so a price comparison for a need to have 5-10 licenses across devices would also have been nice. You have it there for Bitdefender but it is missing for Avast.